The draft code circulated by the Ministry of Housing and Urban Affairs proposed a new set of tenancy laws to enable better control over tenancy agreements. The new tenancy laws that may come into effect at any time may come as a huge relief to numerous landlords in big cities like Mumbai, Delhi, and other major cities where the rents had been fixed decades ago. The new rules state that tenants can be asked to evict the premises if they do not pay rent for two consecutive months. The Tamil Nadu Regulation of Rights and Responsibilities of Landlords and Tenants, 2017, made it mandatory for all tenancy agreements to be registered with the Rent Authority within 90 days from the commencement of the Act. While the Maharashtra government set a bar stating that the landlord cannot increase the rent beyond 15% per annum of the expenses incurred in case of structural alterations. The new Model Tenancy Act aims to protect the rights of both tenants and landlords through the creation of agreements with mutual consent. As all tenancy agreements will need to be informed to the rent authority, the number of disputes over rental properties will reduce. A new concept of Rent Courts will also be introduced to ensure that disputes are settled. What is the Model Tenancy Act? 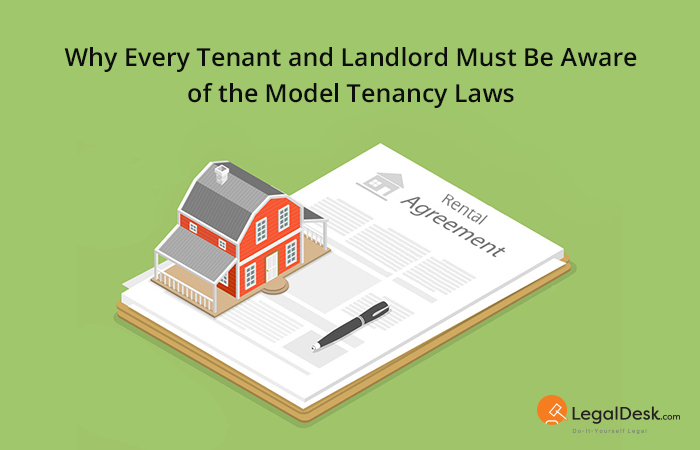 The Model Tenancy Act governs the regulation of rent and balance of rights between landlords and tenants. It establishes a framework to adjudicate disputes and matters that arise between the two parties faster. The Act covers all residential and non-residential properties. Any breach of law by the landlord or tenant under the new Tenancy Act could result in the matter being taken to a Rent Court. Who does the Model Tenancy Law Affect? The Act covers all landlords and tenants. Anyone who has taken a residential or non-residential property on rent or lease or has rented or leased out such a property needs to know the new laws that will govern tenancy that may come into effect at any time. How Does the Model Tenancy Act Affect Rental & Lease Agreements? After the commencement of the Act, there will be new rules to create agreements, renew agreements, revise rent, evict tenants, sublet property, transfer of tenancy rights, etc. All new rental agreements should be in writing and should be informed to the Rent Authority by the tenant and landlord jointly. New agreements created after the commencement of the Act shall be for a period that is mutually agreed upon by the landlord and tenant and be specified in the agreement as well. The terms of revision of rent need to be discussed and clearly stated in the agreement. Landlords cannot charge a security deposit that exceeds 3 months of rent and the deposit will have to be returned to the tenant within one month of them vacating the premises. Tenants can approach the landlord to renew or extend the period of tenancy within the time period agreed upon as stated in the agreement. In situations where the agreement has not been renewed, the term for tenancy has ended and the tenants have not vacated the premises, the tenancy can be renewed on a month-to-month basis on the same terms in the expired agreement for a maximum period of 6 months. Rent can be revised according to the terms agreed upon in the tenancy agreement. If not, the landlord needs to give the tenant a written notice 3 months before the revised rent comes into effect. If the tenant who has received a notice stating an increase in rent and does not give the landlord a notice of terminating the tenancy, it would imply that the tenant has accepted the proposed increase in rent. Rent during the period of tenancy cannot be revised during the tenancy term unless the agreement specifies the amount of increase in rent or clearly specifies the method in which the increase will be calculated. 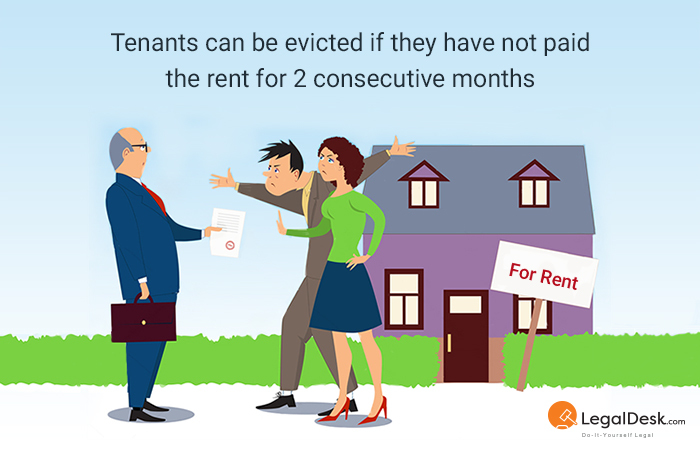 Tenants can be evicted if they have not paid the rent for 2 consecutive months. If the tenant has parted with any of the landlord’s possessions without obtaining a written consent from the landlord. Tenants cannot sublet portions of the premises that they’ve taken on rent or transfer the rights in their tenancy agreement to anyone else, unless it is written in the agreement. In cases where the premises are sub-let, the tenant needs to inform the landlord within a month of commencement or termination of sub-tenancy. While subletting a part of the premises, the tenant cannot charge a rent that is higher than the rent that is charged by the landlord. This law applies only if the successor had been ordinarily living or working with the tenant up to his/her death. After the period of tenancy has begun and the landlord undertakes repairs that are not included in section 15 (ex: addition or structural alteration), with the consent of the tenant, the rent can be revised. In such a situation the increase in the amount of rent will have to be agreed upon by the landlord and tenant before the work commences. The increased rent will be effective from one month after the completion of the work. In a case where there has been a deterioration of the accommodation or housing services, the tenant can claim a reduction in rent. If there is a conflict between the tenant and the landlord, the tenant can approach the Rent Authority. The landlord will either have to restore the housing services or reduce the rent amount. How to Make Your Existing Rental Agreement Compliant with the New Tenancy Laws? To ensure that all existing tenancy agreements are in compliance with the new tenancy laws, tenants and landlords need to follow certain instructions. Written agreements that have been created prior to the enforcement of this Act need to be informed to the Rent Authority. 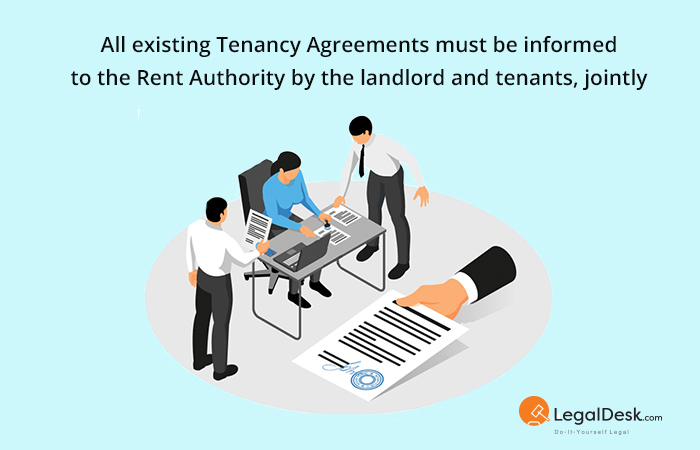 If there is no written agreement, the landlord and tenant will need to enter into an agreement in writing with regard to the terms of tenancy and inform the Rent Authority. When there is no written agreement and in the case of a disagreement between the landlord and tenant, each party needs to separately file the particulars of the about the tenancy with the Rent Authority. In the absence of a written Agreement, the landlord shall have the option to terminate the tenancy as per clause (a) of sub-section (2) of section 21. All agreements that were created before the commencement of the Act need to be renewed and created according to the new terms 12 months after the Act has come into effect. While renewing agreements, if required the rent payable can be revised. The landlord will need to intimate the tenant 2 months prior to the revision of rent. LegalDesk.com offers a very convenient way to draft your rental agreement online and without the hassles of having to visit a lawyer or purchase stamp papers. 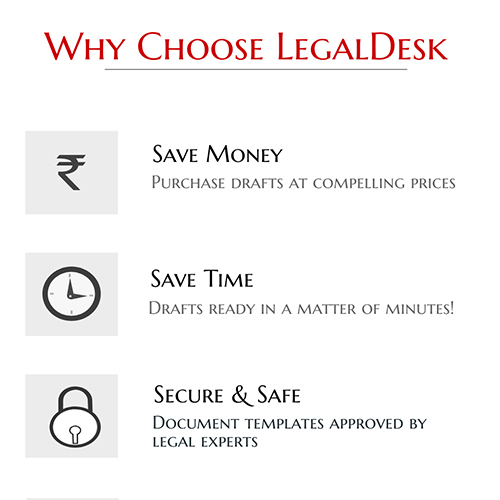 You can also create numerous other legal documents through LegalDesk.com and get them delivered to your doorstep! Add additional clauses if you wish to and customise the document as per your needs. There are 0 comments on "Why Every Tenant and Landlord Must Be Aware of the Model Tenancy Laws".